Finally – you’ve landed a great job, you can’t wait to get started, and it feels as though the long search and effort in finding the job has come to an end. You can relax. However, quite the opposite is true: now the real work begins, and the first 90 days couldn’t be more critical in defining your career. As you can imagine, you’ll be facing new territory at any new job, no matter what your experience or background is. Every new job involves a fresh culture, new people and a new way of doing things. You’ll need to ask timely questions when you find yourself faced with uncertainty. The more difficult aspect of this approach is to know when to ask questions and when it’s okay to take some extra time to learn on your own. When in doubt, it is best to speak up and ask – your new manager(s) will be adjusting to your presence as much as you are, and it’s best to make yourself known rather than keep to yourself in the beginning of a new job. When you first begin, you may feel like a fish out of water, unable to contribute a great deal. Consider questions one of the ways that you can contribute and develop a presence within the company. However, never ask questions simply to ask questions – be sure to develop the angle of any question or clarification that you seek out. For the first 90 days, and often even longer, you should be comfortable with the idea that you won’t be taking time off. When you first start working for a new company, attendance and punctuality are critical. Always make sure to arrive on time (better yet – arrive early) and keep in mind that it never hurts to be the last to leave. 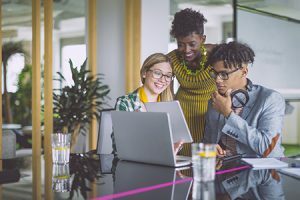 For many Millennials, this approach is very important, as you could be up against generational perspectives in the workplace and as the younger demographic in the office, you’ll need to establish your work ethic early on and combat any potential assumptions that you are too young or uncommitted. Regardless of your age, establishing a very strong attendance and willingness to work hard and long hours is key to setting up a strong first impression. Now is the time to get your hands dirty and explore as many nuances of your new role as possible. Simply saying “yes” in workplace scenarios can help you approach this goal effectively. Say yes to after-work social activities, say yes to extra projects that may require a few hours of weekend work, and say yes to any additional learning opportunities. This will establish you as someone who is eager to learn and willing to participate in every aspect of the company. It will also help you to better understand the company at large. Finally, being a “yes” person establishes an active presence and once again proves that you’re dedicated and bringing energy and new insights to the table. The first 90 days at any new job will be full of challenges and are sure to be somewhat exhausting. If anything, it is important to remember that showing initiative in the beginning always pays off. If you can establish your presence, ask the right questions, and learn as much as possible with a great attitude, you’ll be well on your way to establishing a “halo effect,” a valuable opinion that others hold of you that will inevitably help to propel you in your career.